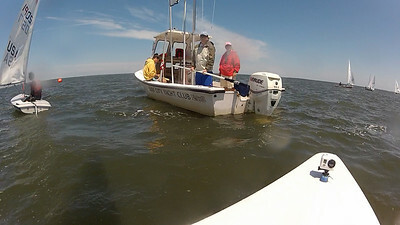 Every year, sailors from all over the east coast drive to Surf City, NJ, in early June for the annual Jack Elfman Orange Coffee Pot Regatta. This event is the longest running Laser regatta in the United States, with a perpetual trophy—an actual orange coffee pot—that goes back to 1972. 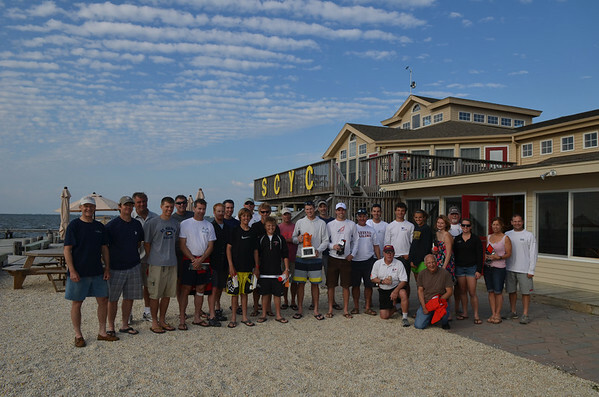 This year, forty boats descended on Surf City Yacht Club on June 2nd to sail for the coveted Orange Coffee Pot. We were met with temperatures in the low 70s, winds ranging from 6-16 knots, and a shifty westerly breeze that made racing tricky for all. Drew Lorenz showed that top young sailors can jump into the 4.7 and have success quickly by winning his division. Kelly McGlynn exerted her dominance in the radial fleet by winning every race. And I was able to hold off Kyle Rogachenko and a handful of other talented guys in a deep full-rig fleet. The wind was very puffy: sometimes I was in puffs in the mid-to-high teens and other times I found lulls that were as low as five or six knots. Downwind, I thought it was really important to look back and try to set myself up for the next puff. When I did get the puff, I tried to point my bow straight at the mark and milk it as long as I could. But if I noticed my puff was almost gone, I quickly looked for the next one and sailed over to it. It was definitely a “cross them when you can” kind of day. Most of the time, it paid to lead the group to the next shift, but a few times, there were big winding puffs that lasted for an entire leg. If I was ever down (in a light spot or a header), I always looked over my shoulder to see if I could cross the guys on my hip and re-position myself for the next puff. Watching the fleet ahead of us was also a big tell-tale sign as far as what to expect. Changing controls was huge on Saturday. With the wind ranging more than 10 knots at times, I was constantly adjusting my sail and tweaking my controls. But besides the great sailing, what makes the Orange Coffee Pot so appealing? Efficiency. Even though this event is a one-day regatta, the Race Committee was able to bang off seven quality races in tricky conditions. Each race was a twice around windward-leeward course and took just less than half an hour. We got plenty of racing in! Great Hospitality. Veteran regatta organizer, Newt Wattis, ensures that everything runs smoothly; from the friendly volunteers, to the amenable RC who will run races the way the sailors suggest, to the delicious food and drink after the race, thing went off without a hitch. The Awards. Great awards were provided from gift certificates to sailing parts. What made the awards cool was that not only did everyone get an award, but they were also given out in reverse order with the guys lower in the fleet getting first dibs at what they wanted. It was pretty cool! This event is definitely a "must-attend" if you are in the area. It’s already on the calendar for next year, scheduled for June 1, 2013. Be there!